Big Brother Spoilers > Big Brother > Big Brother 18 > Big Brother 18 Cast Swimwear pics. Big Brother 18 Cast Swimwear pics. Tomorrow is the 2 hour premiere at 8pm PST, Thursday’s show starts at 9 with a duration of 1 hour. After Thursdays show airs the feeds are to start and all the craziness begins. To get everyone back in Big Brother 18 mode here’s this years cast swimwear pics. Less than 24 hours till BB18, this is worse than waiting for Christmas Eve. I can’t wait! Just remember, you will never like this cast more than you do right now. Does anyone think there’s a reason that they are making a point of showing us each persons legs and feet reflection in the mirror window in the background? Or am I just thinking too far ahead? Oh it’s so good to be back for another season of BB! Thank you once again to Dawg and Simon for continuing to bring us updates! It means so much! Zakiyah and Bronte (minus the voice) are my early favorites to win. I need to see most of these people in the house before I make better judgement though. I must say that Victor in his interviews was much better than I thought he was going to be (he might have been someone who exaggerated their personality to get cast). Jozea is another interesting one. An obvious recruit who is either going to go far because of his sociability and physicality or is going to implode ala Devin and Audrey. Either way I suspect he’ll make the feeds entertaining. Paul’s another interesting fellow who could be good for the feeds/TV, but I’m not sure I see him winning. Michelle looks like the love child of Christine and Nicole, and I’m not sure whether that’s a boon or a curse yet (not pleased about her fat shaming on Reddit though). Booo this cast looks so boring. Why cant they get real people these fake wanna be actors are why its getting worse every year. Can’t be any worse than BB16, just remember. So excited for a new summer of BB. Hope it’s a great one. Thanks in advance to Dawg & Simon for all the hard work, especially for us Canadian’s who don’t get feeds. I love having highlights here to keep me updated. Very much appreciated. Paul’s Tattoo is ridiculous – holy crap! – Love it. He’s an interesting guy just from observation but the beard I keep waiting for a finger to poke my eyes out . Just too much of it. What’s to love about that? It looks ugly and ridiculous. If he was going for ‘cool’, he missed the mark by a mile. I also checked out his supposed company, well, all I saw on his website were t-shirts with the word “F” on them that you or me could make at home for $5. He seems like a wannabe to me, but I’ll reserve full judgement until it starts. This is my initial impression. I’m with you. I already don’t like him lol. Maybe that will change though. I hope he won’t be another Austin: trying too hard to be cool. I liked Austin until he let the twins use his d! @* as a handle to lead him around. Then he was just another dumbass. So now I REALLY don’t like him. Blah. Hope he’s one of the first to go. My first impressions are usually wildly out of sync with what the houseguests are really like inside the house. I have no idea who I will be rooting for this season. I can’t judge just on (bikini) pics. Once again I wish the house were “older” and not so “hollywood wanna bes” but we shall see. Natalie will be looking for a showmance. Zakiyah will not be looking for a showmance. Victor will be looking for a showmance. Glenn will not be looking for a showmance. Paul will stir up the most trouble in the house. Michelle will also stir up the most trouble in the house. The final three will be: Bronte, Michelle and Natalie. I don’t know what to make of Bronte. She almost gives off an Ian vibe. I feel like Cody’s brother is going to do something dumb like show off his tattoo and out himself as Cody’s brother. Then the HG’s will want to evict him, but production will swing the show in another direction. Great post Simon. My favorite of the season so far. LETS GET READY TO RUMBLE,!!!!!!!!!!!!!!! HAHAHA we’re ready.. I think..
I’m trying not to get too hyped up because recent seasons have been supremely disappointing. Maybe this year Casting will have gotten it right – drama I can take, but paranoid psychotic nut jobs are SO last year. Make sure that pantsuit has lots of give in the rear. I hear that prison food is nothin’ but starch. Still rootin’ for Glenn. He obviously follows his own drummer……and clothing designer. I’m rooting for Glenn too! Although I don’t think he’ll last that long, maybe go out first 3. If he stays any longer it will only be because HGs will use him as an easy pick to put up against the real target. Hope I’m wrong, sounds like he’d be interesting. I think that Bronte will make it far unless vanity gets the best of her and she lets out about being good at mathematics. Hell, even I like Zakiyah, and I’m racist! Paulie and Tiffany are leading the poll? Looks like I’m going to be in the minority to start the season. I did it like this: Dawg (obvs), Zakiyah, Bronte. I don’t understand how you can’t root for Dawg to win. It would be — and someone might want to doublecheck my facts on this — the first time in BB history that the game was won by a non-contestant. I’m not a fan of Vanessa’s sister and Cody’s brother being on the show. 10 of 12 are 23-27 years old. Vanessa’s sister and the cop are 32 and 50 respectively. I think the biggest problem the show has with getting a truly diverse crowd is the fact that it’s 3 months long and there are few people who aren’t looking to change careers who can take that kind of time off. Grodner said this is a really diverse crowd? Hopefully they are entertaining and don’t spend every moment trying out to be on another show. I love the idea of Big Brother but it’s execution the last few years has been spotty. Too many Hollywood recruits & agree Cody bro Paul ie & Van sis Tiffany worst. Tiffany says she huge IQ, stalking prey gamer & better social skills than Van cuz she’s bi-sexual and will do it with whoever she needs to, ugh. We know how Cody worked Christine for votes, ugh. Bronte CIA mugging as babysitter. All actors this year. Is it wrong that I am already rooting for Zakiyah to knock Cody’s brother off his game? Brontes voice is like nails on a chalk board. Love that Da learned to keep her mouth shut … she might have a shot to make it a little further this season. Anyone else notice how quiet the room got when the Texan said where he was from? lol… He probably wont last very long but I hope he does. Im very excited for a summer of BB! Thanks Simon and Dawg for another great summer!! Like the new twist of teams of four, it will even out things and give the returning HGs a better chance. 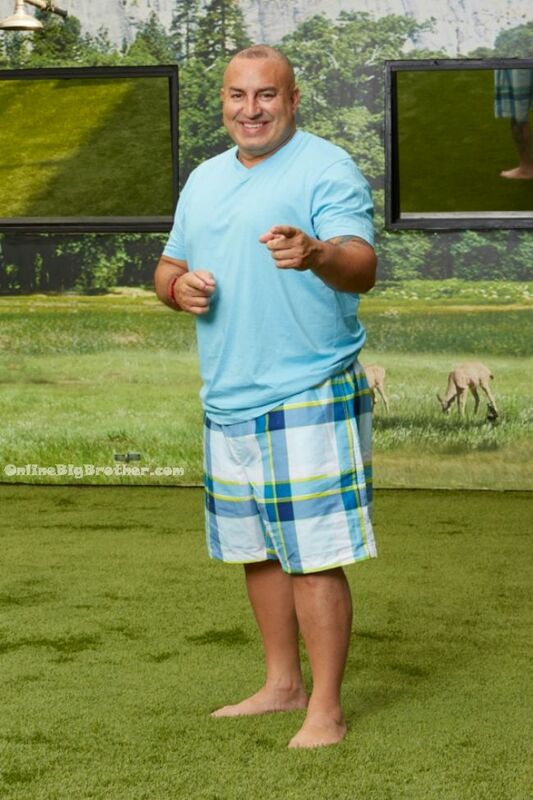 Of all the returning HGs, the only one that deserves to be there is Frank. I just wish they’d stop having HG’s wear ridiculous footwear in these swimsuit photos. I get that it’s a photo shoot and it’s in California but good Christ make it stop. Good to see everyone here again. Looking forward to a good season. Happy to see James and already hating Da again. She won’t last long. She and Paul not hitting it off and I think Da will go early. Too bossy. I wish BB would give America more of a chance to provide suggestions. I like the Roadkill twist but I have one for them….give one of them a chance to win a special power to FLIP THE VOTE. If used and a vote is 3-9 to send someone packing it now becomes 9-3 to keep the person..now that would be twist that would really cause the house guest to think about how they vote. Or give them a hidden immunity like Survivor..